For other people named Johnny Lewis, see Johnny Lewis (disambiguation). Jonathan Kendrick Lewis (October 29, 1983 – September 26, 2012), also credited as Johnny K. Lewis, was an American film and television actor. Lewis is best known for playing Kip "Half-Sack" Epps in the first two seasons of the FX series Sons of Anarchy. He also appeared in supporting roles in the films Underclassman (2005), Aliens vs. Predator: Requiem (2007), and The Runaways (2010). Lewis grew up in the Los Angeles neighborhoods of North Hollywood and Sherman Oaks. He was the middle child of Michael and Divona Lewis. His parents were practicing Scientologists and Johnny was himself a Scientologist for most of his life. After finishing school, he left home at the age of 18 to pursue an acting career. Lewis began making television appearances while in his late teens, with guest starring roles in Boston Public (2000), The Guardian (2001), and American Dreams (2002), among others. His debut feature film performance premiered in 2004, in New Line Cinema's Raise Your Voice, and he followed that up with Miramax Films' Underclassman in 2005. He co-starred as Pearce Chase, one of five siblings on the Fox series Quintuplets, and appeared in the movie Raise Your Voice (2004) alongside Hilary Duff. He guest starred in four episodes of the Nickelodeon television series Drake & Josh as Scottie, one of Drake's bandmates, and from 2005 to 2006, he played Dennis "Chili" Childress on The O.C.. Lewis also had a guest spot in the third episode of Smallville season 5. He also starred in the film Magic Valley (2011), which premiered at the Tribeca Film Festival. Lewis was well known for his role as prospect biker Kip "Half-Sack" Epps in the first two seasons of the FX original series Sons of Anarchy. Lewis dated American singer Katy Perry from 2005 to 2006. In mid-2009, Lewis learned he and his then-girlfriend, actress Diane Gaeta, were expecting a baby. The couple had split up by April 6, 2010, when the couple's daughter, Culla May, was born, but briefly attempted sharing a residence. Lewis eventually moved out, after which the couple engaged in a "long and painful" custody battle that Lewis ultimately lost. Lewis was raised in a "Jewish-oriented household", though his family also practiced Scientology; his parents attained the highest available level within Scientology, called "Operating Thetan", or OT VIII. He starred in Scientology training films, and was a sponsor of the Scientology drug rehabilitation group Narconon. Lewis left the Church of Scientology in his early 20s. Lewis was arrested three times between 2011 and 2012. In January 2012, he struck two men in the head with a bottle while engaged in a fight. He pleaded no contest to charges of assault with a deadly weapon in the case. The second arrest came about six weeks after the first, with Lewis accused of attempting to break into a woman's home. He pleaded no contest in that case as well. Considering the cases, a probation official expressed that he was "very concerned for the well-being of not only the community but that of the defendant", that Lewis suffered from mental health issues as well as chemical dependency, and that Lewis would "continue to be a threat to any community he may reside in". Lewis was released from a Los Angeles County, California, jail on September 21, 2012, five days before his death. On October 30, 2011, Lewis suffered head injuries from a high-speed motorcycle accident. Though an MRI was recommended, and Lewis's father scheduled MRI tests twice, Lewis refused to take them. Lewis's father also states that he "pursued and encouraged psychiatric treatment for his son. It was Johnny who refused to comply." He started manifesting bizarre and illogical behavior from that point on and concurrent to his ensuing legal troubles. Bill Jensen reports in Los Angeles magazine, Lewis and his attorneys pushed for rehab for marijuana addiction. When Lewis rejected this, they pursued rehab for alcoholism, to avoid trial. In early August 2012, Lewis was well enough to be granted provisional out-patient status. He made a deal with the District Attorney of the San Fernando Court - his freedom for "time served". Lewis was assured that he would likely just spend a couple more days in jail, no more. The couple of days turned into nearly two more months, during which he suffered a severe downturn in health and spirits. Released from jail September 21, he determined to make his own way and get his life together. On September 26, 2012, Lewis and his 81-year-old landlady Catherine Davis were found dead at Davis' home. Officers from the Los Angeles Police Department (LAPD) found Lewis' body on the home's driveway. Davis was found dead inside the villa, which appeared to have been ransacked. Davis' death was investigated as a homicide, in which Lewis was a suspect. It was later determined that Lewis had broken into the house, murdered Davis and killed her pet cat Jesse. According to multiple reports, police were called to the scene after neighbors heard the 81-year-old woman screaming. Neighbors told police they saw a man jump the fence on the Davis property, assault a painter and a homeowner next door, then jump back over the fence. According to the LAPD, Lewis then either fell or jumped from the roof, garage, or patio of Davis' villa. An autopsy report released on November 29, 2012 stated that Lewis did not have any drugs or alcohol in his system when he died. Lewis had a history of drug abuse, leading to speculation by his attorney that the actor may have suffered a drug-induced psychosis when he allegedly killed his landlord. However, toxicology reports came back negative for alcohol, cocaine, marijuana, psychedelic drugs, or anti-psychotic medication. The autopsy report did indicate he had suffered partial strangulation and had fingernail marks on his neck when he died. There was no indication that Lewis had been pushed or that he jumped from the roof in an act of suicide. His death was ruled accidental. His family has spoken out about Lewis's history of untreated head trauma, leading some to speculate that he developed a psychological disorder, which led to his sudden spurts of violence. Sons of Anarchy creator Kurt Sutter tweeted about Johnny Lewis's death: "It was a tragic end for an extremely talented guy, who unfortunately had lost his way. I wish I could say that I was shocked by the events last night, but I was not. I am deeply sorry that an innocent life had to be thrown into his destructive path. Yes, it's day or [sic] mourning, but it's also a day of awareness and gratitude. Sadly, some of us carry the message by dying." 2000 7th Heaven Norton Episode: "Tunes"
2000 Malcolm in the Middle Cadet Martin Episode: "Therapy"
2001 Judging Amy Desmond Episode: "Surprised by Gravity"
2002 The Guardian Ted Popper Episode: "Mothers of the Disappeared"
2002 Yes, Dear Ricky Episode: "Making Babies"
2005 Smallville Gabriel Duncan Episode: "Hidden"
2006 CSI: Crime Scene Investigation Tad Sidley Episode: "Up in Smoke"
2007 Bones Enzo Falcinella Episode: "The Priest in the Churchyard"
2007 Shark Michael Hackford Episode: "Student Body"
2008 Cold Case Truitt "Spider" Leland '98 Episode: "Spiders"
2009 Criminal Minds Eric Ryan Olson Episode: "Zoe's Reprise"
^ Jensen, Bill (January 30, 2014). "The Secret Life of Johnny Lewis". Los Angeles Magazine. Los Angeles, CA. ^ "Johnny Lewis, Katy Perry: Singer Distraught Over Ex-Boyfriend's Untimely Death". The Huffington Post. September 27, 2012. Retrieved May 30, 2016. ^ a b c d e Bill Jensen (January 30, 2014). "The Secret Life of Johnny Lewis". Los Angeles. p. 1 of 3. ^ Baker Machado; Sheena Rao; Alexis L. Loinaz; Melanie Bromley. "Johnny Lewis' Scientology Link: Sons of Anarchy Star Was "Born Into the Church," Source Says". E! News (UK). Retrieved September 29, 2012. ^ Dillon, Nancy; Cavaliere, Victoria (September 28, 2012). "'Sons of Anarchy' actor Johnny Lewis was 'out of control' before rampage, championed Scientology drug-treatment program before rampage". nydailynews.com. Retrieved January 9, 2013. ^ a b c d Risling, Greg (September 28, 2012). "Warning signs seen before actor's violent end". Associated Press. Retrieved September 29, 2012 – via Yahoo! News. ^ "The Secret Life of Johnny Lewis". LAMag. January 30, 2014. ^ a b c d "Suspect in killing of Los Angeles woman was actor". AP via Yahoo! News. September 27, 2012. Retrieved September 27, 2012. 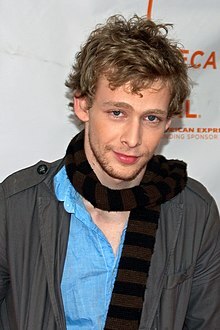 ^ "'Sons of Anarchy' Actor Johnny Lewis Found Dead -- Suspect in Bizarre L.A. Double Death". TMZ. September 27, 2012. ^ "Johnny Lewis Dead: 'Sons Of Anarchy' Actor Found Dead Outside Los Feliz Woman's Home". The Huffington Post. September 27, 2012. ^ "Katy Perry's ex, Johnny Lewis, found dead". Toronto Sun. September 27, 2012. Retrieved September 27, 2012. ^ a b c McCartney, Anthony (November 29, 2012). "Actor who apparently killed landlady not on drugs". Associated Press. Retrieved December 1, 2012 – via Yahoo! News. ^ "Sons of Anarchy creator Kurt Sutter responds to Johnny Lewis' death". LA Times. September 27, 2012. This page was last edited on 22 February 2019, at 00:14 (UTC).